Save 15% with Classic Industries Visa®! We offer you a new way to save on the restoration parts and accessories you need, with our all-new Classic Industries Visa® card. Show off your enthusiasm for timeless cars with one of our 5 Classic Industries designs—plus, get great rewards on each purchase! You read it right—When you use your Classic Industries Visa® with us, you save up to 15% off* most orders from Classic Industries! You also get other great benefits like competitive rates and terms. Follow this link for the most updated pricing and fees disclosure. Plus, you'll be able to show off your enthusiasm for classic cars every time you use your card. There's no excuse not to have a Classic Industries Visa® in your wallet! With the Classic Industries Visa® Card, you get to show off your enthusiasm for timeless cars every time you use your card, plus you get all the benefits of a Visa® Rewards Card! Earn 1 point per dollar spent on purchases. Redeem your points from a seemingly endless selection of rewards. You can redeem for account credits, gift cards, merchandise, travel and more**! Receive up to 15% off* your order from us every time you use your Classic Industries Visa® Card! Competitive rates and terms. Follow this link for the most updated pricing and fees disclosure Visa® Card! 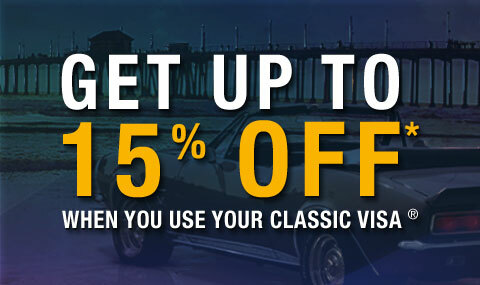 Apply now at 800-821-5184 for your Classic Industries Visa® Rewards Card today to start earning Rewards points and saving up to 15% off* each order from us for your classic vehicle's restoration! *Note: This discount cannot be combined with any other offer. Some exclusions apply. **Note: Once approved. Please see Rewards Program Rules that accompany your card in the mail for more details.